The Peggy Martin Rose Fund began after Peggy Martin, past president of the New Orleans Old Garden Rose Society and avid rose collector, returned to her home in Plaquemines Parish after Hurricane Katrina in 2005 to find a scene of total devastation. Her home and garden were inundated by 20 feet of salt water for two weeks and, even worse, both her parents were victims of the flooding. When she returned several months later there were only two plants surviving: a crinum and a rose that we now know as the ‘Peggy Martin’ rose. Several years before the Hurricane I had spoken to the New Orleans Old Garden Rose Society while a guest of Peggy Martin and other friends in New Orleans. I brought back to Texas cuttings of the so-far-unidentified historic rose and observed it for several years at Fragilee, our weekend home near Brenham. 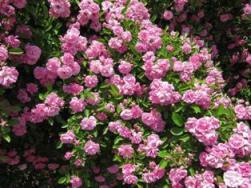 I was impressed with its bright pink clusters of roses and thornless stems. 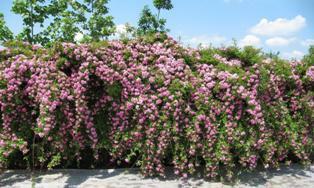 It is a mannerly climber but vigorous grower with few problems with disease or insects. It is also not particular about soil type and thrives with little irrigation once established. At first it bloomed only in spring but after “settling in” for a couple of years it now blooms in fall as well. Upon hearing of Peggy’s tragic losses and the symbol of hope provided by the surviving rose I urged a number of rose growers to propagate and distribute this rose while donating a portion of the sale of each plant to the newly established Peggy Martin Rose. The fund’s goal is to aid in the restoration of gardens in the swath of Hurricane Katrina. The growers responded generously and we are now able to disburse the collected funds. Others engaged in helping to establish the fund at the Greater Houston Community Foundation were Nancy Thomas and Nancy Godshall. Events like The Bulb Mart, a project of The Garden Club of Houston, have sold hundreds of ‘Peggy Martin Roses’ over the past several years and helped to spread the word even further. Many Master Gardener groups also helped spread the word in their communities. The growers who have enthusiastically supported the fund included Mike Shoup of The Antique Rose Emporium, Brenham; Jason Powell of Petals from the Past Nursery in Jemison, Alabama; Mark Chamblee of Chamblee Rose Nursery, Tyler; and Aubrey King of King’s Nursery, Tenaha. Peggy Martin, now in Gonzales, La., has provided numerous programs and generous support for the project. Many garden writers and others interested in heirloom plants and our southern gardening traditions provided publicity articles. “Beautify Beaumont, Inc.” has recently received an award of $3,000.00 from the Peggy Martin Rose Fund for purchasing, planting and maintaining their beautification projects on Phelan Boulevard, a main artery in West Beaumont. Beautify Beaumont has been dedicated to restoring the community landscape because two hurricanes in the last five years created such destruction. Micah Meyer, Texas AgriLife Extension Horticulture Agent for Jefferson County (Beaumont vicinity), has taken an active part encouraging restoration and beautification efforts in cooperation with the Master Gardeners of the county. Well selected trees, roses and ground covers are making a big difference in the appearance of the entire community. “Beauvoir,” home of Jefferson Davis and located in Coastal Mississippi, was severely damaged when Hurricane Katrina struck in September, 2005. As many as 400,000 people were evacuated from the Mississippi Coastal areas (almost the population of central New Orleans). Many historic buildings were destroyed including the cottages and second story mansions around “Beauvoir.” Hundreds of irreplaceable historical pre Civil War era artifacts were either lost or destroyed. Valiant Mississippians have been working hard to restore and enhance historic structures and gardens. Included are exciting plans for an authentic restoration of the garden, which will include a splendid rose planting featuring the shrubs and climbers of the past which just by their names and fragrances evoke a bygone era. The Peggy Martin Survivor Rose Fund is providing $3,000.00 for this effort. The Pitot House Museum and Garden is a property of the Louisiana Landmark Society and is representative of the country houses or plantations along Bayou St. John in New Orleans at the end of the 18th and beginning of the 19th centuries. This house is a fine example of the raised basement colonial home. It is the only Creole Colonial Style House Museum in New Orleans and tells the story of life along Bayou St. John from the earliest days. There is a classic parterre (geometrically patterned) garden. Adding fresh plantings of old garden roses not only helps make the site more beautiful but adds historical significance to the showy plant displays surrounding the house. Their award from the Peggy Martin Rose Fund is $6,000.00 and work on the garden is ongoing. As we realize the pleasure and inspiration that beautiful and appropriate plants provide to all of us we are even more determined to ensure that they are part of historic sites and community landscapes. Time-tested heirloom plants like the ‘Peggy Martin’ rose help to create resource efficient plantings that require less water, chemical applications and gardener’s time in memorable settings while refreshing the human spirit. Vigorous climber that can easily reach 15 plus feet. Flowers: bears clusters of pink shaded flowers that occur from spring through fall. If you are a novice rose grower or afraid you won’t be successful with roses, plant this rose. This rose will surprise you and within a couple of years, your neighbors will come begging for cuttings.